Yes, you can setup your system via port forwarding. Although, this setup is recommended for more advanced users. You will need to note the IP Address of the NVR/DVR. To obtain this, go to Main Menu>Maintenance>System Info>Network, your IP address will be the IPv4 address at the top. Then you’ll need to log into your router via web browser on a PC. Once logged in, you’ll need to add ports 80, 8000, and 8554 to the port forwarding rules. For help with port forwarding for your router, contact the manufacturer or your ISP. There are also guides for a lot of various models of routers here https://portforward.com. DVR1 80 80 TCP 192.168.x.x. DVR2 8000 8000 TCP 192.168.x.x. DVR3 8554 8554 TCP 192.168.x.x. 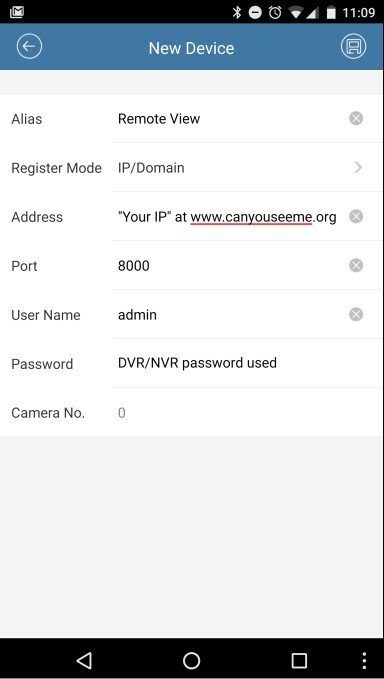 To make sure test the ports on www.canyouseeme.org, and if they are open you can add the information to your phone app. Tap the Menu icon on the top right then Devices and press the (+) on the top right, choose “Manual Adding”. Camera No. : updates after “Save” on step 3. Save on the top right. *Make sure Wi-Fi is off on the phone when attempting the remote view.